A couple weeks ago the wonderful people from C&H® / Domino® Sugar contacted me and asked if I would like them to sponsor a post on Baked Perfection. What baking blog is complete without sugar? Of course I jumped at the opportunity. To help with expenses they sent me a $20 gift card to use on ingredients. There are a ton of delicious recipes and treats on the C&H® / Domino® Sugar website, but I really wanted to make a cookie mix in a jar to give as a gift. 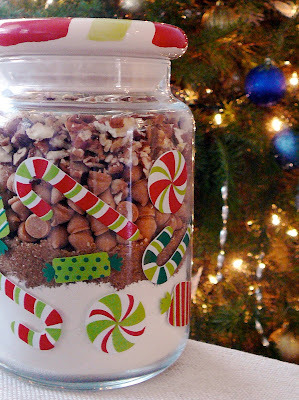 I have wanted to make a cookie mix in a jar for years, but never got around to it. After finding the perfect jar for a mix I knew I had to make something. The C&H® / Domino® Sugar website had several great options, but in the end the butterscotch and pecans in this recipe won me over. If you know anybody that loves to bake I think this would be a perfect gift. Also, don't forget to enter the Give Away on my cookie dough truffle post! Combine flour, baking soda and salt in a small bowl. Spoon into 1 quart, widemouthed canning jar. Layer remaining ingredients in order given, making sure to pack down each layer firmly. Clean inside of jar with a dry paper towel after each layer. Decorate lid by cutting fabric into a 7-inch wide square or circle. Secure with a rubber band and tie with a decorative ribbon and accents. Attach these instructions to the jar: In a large mixing bowl, cream together 2/3 cup softened butter or margarine, 1 egg and 1/2 teaspoon vanilla until combined. Slowly add contents of jar and mix well. Drop by rounded teaspoonfuls onto greased cookie sheet. Bake at 375°F for 9-11 minutes or until lightly browned. Makes 3 dozen. Having all the comments erased doesn't let viewers know if they should try your recipe or not. Personally it alarms me and makes me think that people were saying it wasn't any good. To your point Anonymous - the recipe leaves out baking powder and the ratios are off. It should be about 1:2:3 - one part butter to 2 parts brown sugar to 3 parts flour. So I'm betting these didn't bake up right. Hello, the comments were erased because of spam which included malicious links to external sites, not to mislead you. Unfortunately I made these cookies so many years ago I cannot remember how they turned out.